One of the major touristic points of the Peruvian capital is in Miraflores. This district, located in front of the sea, offers travelers the possibility to do countless entertaining activities, from walking by the Larcomar mall, visiting art galleries, to doing adventure sports, like paragliding. Paragliding, contracted word from “parachute and gliding,” is a sport that emerged from the ingenuity of mountain climbers wishing to descend by parachute from the hilltops they had reached. The descent is done with a light glider, flexible and easy to transport and handle because it has no motor or rigid parts in the wing. The rest of the equipment includes a helmet, a flight chair with airbag, boots and flying suit, anemometer to calculate the air’s speed, altimeter to calculate altitude in respect with the speed of descent, and a GPS (Global Positioning System), in order to determine our exact location. 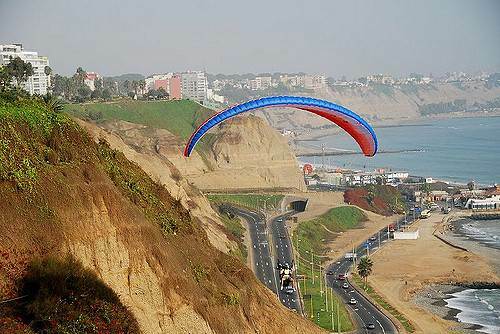 Within Miraflores and the city of Lima, the best place to do paragliding is the Park Raimondi, which in the year 2006 won the Premio de Parques y Jardines (parks and gardens prize), organized by the metropolitan municipality, due to its infrastructure and beauty of its green areas. In its over nine acres, this park has a labyrinth formed entirely by bushes, a pine forest, three small gymnasiums, kids playgrounds, various ocean-viewing points and a pool which is illuminated at nighttime, as well as annexed paths and bike paths for walkers and cyclists. Toward the south end of the Park Raimondi, a paraport has been built to enable the take-off and landing of amateur and professional paragliders. As opposed to the other areas of the park, the pedestrian protective wall by the paraport, is located at a greater distance, so as to give the sportsmen a greater movement area. Likewise, there is no longer the need to jump above the wall, or risking having any part of the equipment get hooked on the wall and thus having accidents. If we are passing through Lima, and wish to have some leisure time gliding through the airs of the coast of Miraflores, we can get in touch with the travel agency Viva Travel Guides, which has professional paragliding instructors who give travelers master classes in just one day (flights are about fifteen to twenty minutes long). In addition to including equipment rental and learning the best flying techniques, the best part is that anyone can do it, without requiring previous experience, and they can take our pictures as a keepsake.